Computer quantum health check system is a kind of health examination instrument that can make noninvasive and swift checkup to human body. The electromagnetic wave signals emitted by the human body represent the specific state of the human body, and the emitted electromagnetic wave signals are different under the different conditions of the human body. Computer therapy and acupuncture provides the massage through the acupoints in projecting parts of body, readjusting the functions of the pathological organs. Fully Automatic Treatment - auto-selection of acupuncture points on the ear, hand, foot and SPA. The only action she needs to take is the adjustment of the intensity of the pulse. The conductive garments (Gloves, Socks, Knee, Elbow, Pads) are made with high quality silver fiber threads which conduct the electrical impulses throughout the whole garment, providing acupuncture and massage therapy stimulation over the complete area covered by the garment. Producing an even distribution of stimulation giving maximum comfort and efficiency, and complete ease of use. Great alternative for sufferers with skin too sensitive for traditional electrodes are ideal for home treatment. Operation System: Windows 10,8,7 COM Port USB 1.1/2.0 . 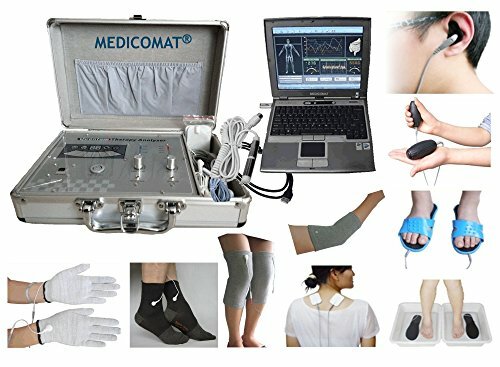 Package Includes: Main Machine x 1 piece + USB Cable x 1 piece + Test Rod x 1 piece + CD/USB Software x 1 piece + USB(Dongle/Key) x 1 piece + Ear electrode × 4 pairs + Hand Electrode × 1 pair + Shoe Pad × 1 pair + Conductive Socks: 1 pair model: S101 size: 43-46 color: grey + Conductive Electrode Gloves: 1 pair model: G101 size: L color: silver grey + Conductive Electrode Knee Sleeve: 1 pair model: K102 size: 25X16X19cm color: grey + Conductive Elbow Sleeve: 1 pair model: A101 size: 13X15X20cm color: grey + Conductive Electrode pads × 1 pair + Two-pin wire × 2 pieces + Machine-Computer USB-Wire x 1 piece + Aluminum case x 1 piece + User Manual × 1 copy. Medicomat® Medical Automat Series * THE WORLD'S BEST HEALTHCARE APPARATUS * Senior Health Solutions * Health Test and Therapy Computer System - In 5 Minute, It Can Know Your Body Health Status - 41 Health Reports; comes with 2 languages: English and Spanish on the same machine.